This article provides a step-by-step process for installing firmware on the Sargas 2-port reader from ThingMagic. First, download the latest firmware available from the link above and save the file to a known location. You will need to extract the firmware files from the zipped folder. 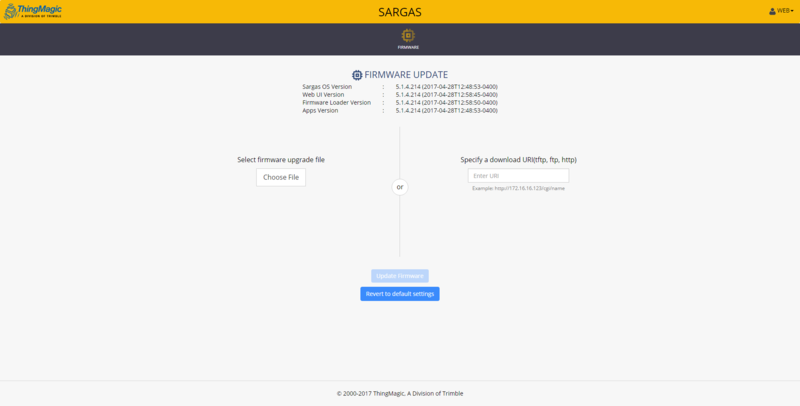 For the Sargas reader, the firmware should be divided into multiple files once extracted. 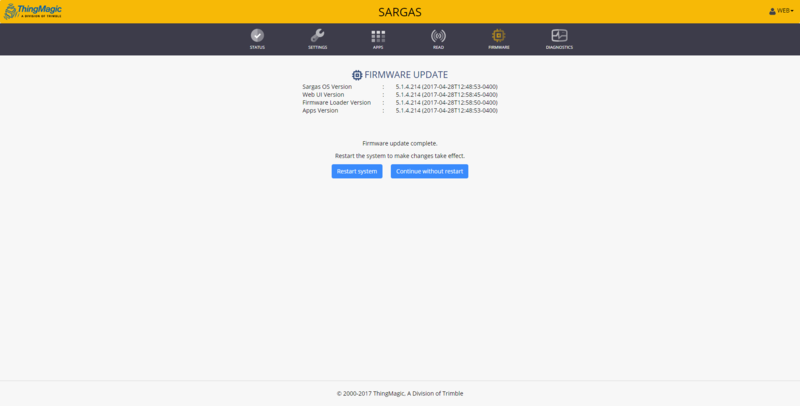 Firmware can be installed on the Sargas reader by accessing the reader's Web UI. For instructions on accessing the Web UI, please see Setting Up Your Sargas Reader. Once the Web UI is accessed, navigate to the Firmware tab. Once there, select the "Choose File" button and navigate to the directory in which the firmware was saved. Choose a file to upload, and then select "Update Firmware". Once the file has been uploaded, you will have the choice of either restarting the reader or continuing without restart. Select "Continue without restart" until all firmware files have been uploaded, since this process will need to be repeated for each firmware file in the directory. Once all files have been uploaded, select "Restart system" to restart the reader and complete installation of the firmware. If for any reason the Web UI or Firmware tab are not reachable, the reader will need to be accessed in Safe Mode. To do this, simply follow the steps for accessing the Web UI, but add the port number "8888" to the end of the URL string. For example, if the Sargas hostname is "http://sargas-b35dc8.local", the Safe Mode hostname would be "http://sargas-b35dc8.local:8888". While in Safe Mode, the user will only be able to update the reader's firmware or revert the reader to default settings.